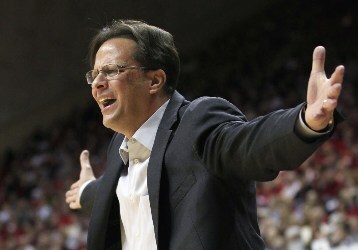 Tom Crean's Indiana squad has lost three consecutive games. Yesterday was simply the latest reminder: we don’t know anything about the Big Ten yet. After the wild past seven days, during which Indiana was defeated three times (the latest coming last night, from Nebraska, which had only previously beaten Penn State), Michigan State has lost twice (but right after Northwestern stunned MSU the Wildcats were rocked by resurging Wisconsin) and Ohio State fell to Illinois. My Saturday power poll could be significantly different in two days than it was a week ago. But as crazy as it has been, the early flukes, upsets and shocks might have been a testament to just how strong the Big Ten is this year. Evidence of the depth and potential within the Big Ten is this CBS sports-created, constantly-evolving tourney bracket that has nine Big Ten teams – including, yes, Minnesota as a 10-seed -- grabbing a ticket to the big show. 1. It’s possible both Michigan State and Indiana were playing over their heads a little bit. If you put the Spartans' loss at Michigan in a prism, it’s understandable – the Wolverines are a good team and Crisler is a tough place to play – but coming after a stunning loss to Northwestern, you have to win that one. Indiana, on the other hand, is now in the throes of a three-game skid. Where is the team that beat Kentucky and Ohio State earlier this year? 2. Nebraska could be an interesting team, now that the Huskers are fully healthy. Brandon Richardson and Jorge Brian Diaz are now back, and Nebraska could be threatening to be among the “good.” The Huskers have had four losses by single digits already, and now they’ve won two of three, stunning Indiana on Wednesday. Could be a team to watch going forward. 3. I still don’t know who Purdue is. The Boilermakers have alternated wins and losses for the last five games. They were blown out by Penn State a couple of weeks ago and lost a close one to Wisconsin at home. But they beat Minnesota on its home court and then – after looking like a terrible team for an entire half – overwhelmed Iowa late on Tuesday. Sometimes they look great; sometimes they look like an NIT team. The jury is still out.